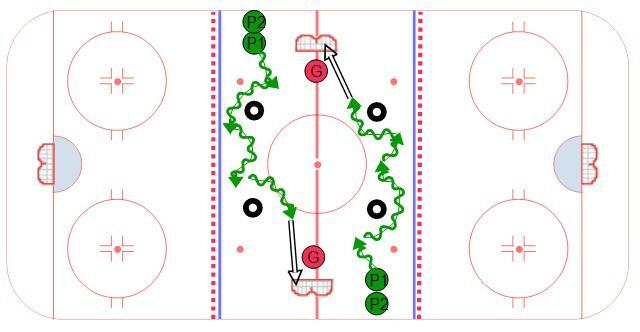 Here is a hockey drill that can be used for the younger players in a practice that set up for station drills. This drill can be used in the neutral zone using four tires (or cones) and two of the small nets. Arrange the tires as shown in the diagram with two lines, each off to the side of the net. Player 1 in each line will skate with the puck up to the first tire and make a single shift move to the outside. On the second tire they should make a single shift move to the inside and take a shot on the net. Therefore each player is making a move to their forehand and backhand sides. As players become more skilled you can use this same set up to work on other moves as well.